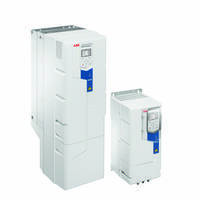 The new ABB ACQ580 variable frequency drive (VFD) enhances system performance. This product enhances wire-to-water/-air efficiency, while simplifying operation. It is more reliable in municipal pumping and aeration applications. The ABB ACQ580 is now available through authorized ABB water and wastewater channel partners. The VFD includes features that work best in municipal markets, such as the ability to dislodge debris from impellers. A sensor-less flow calculation feature provides an accurate flow measurement without a flowmeter. The soft pipe fill mode lessens water-hammer damage and the quick-ramp feature protects submersible pumps. The ACQ580 is compatible with ABB Ability™ condition monitoring services, allowing customers to obtain real-time data from monitored equipment. The product has dry-run protection that stops pumps from running without water. It also features embedded PID controllers that automate flow, pressure, level and dissolved oxygen. The VFD features technology that manages the operations of up to eight pumps simultaneously. The ACQ580 has a menu-based programming for an easy set-up as well as a simple keypad.